Bus accidents are far less common than car accidents, but when they happen, the consequences can be severe. Bus accidents are not limited to collisions between a bus and another vehicle. In fact, poor bus maintenance and pedestrian accidents are the most common types of bus accidents resulting in serious or fatal injuries. Being a passenger on a bus means you give 100% control to the driver and his or her bus company and their negligence can result in your injury. 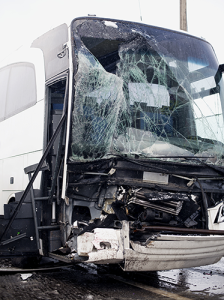 Due to the varying levels of bus accidents, such as a pedestrian collision, tire blowouts, poor maintenance or bus driver negligence, accident claims can be complex to litigate, with multiple responsible parties at fault. Since buses are usually controlled and operated by local, state and federal government entities, legal actions that stem from bus accidents can often prove quite complicated. For example, making claims for damages against a local school district requires all paperwork and files claimed in a very short time period. Additionally, bus companies usually have unique insurance that is more comprehensive than standard car insurance, resulting in limited financial help for the victim. An experienced law firm can help you evaluate your options or work around the limits of an insurance policy. If you or a family member has been injured in a bus accident, contact O’Donnell Law Offices for a free consultation so we can help you get the maximum amount of compensation you deserve. There is no fee or costs until we win your case.